Condition: New ลูกบิดกีตาร์วินเทจ 50s สีโครมใบหยก Kluson Genuine Kluson 3L3R Vintage 50s-back Tuners with Keystone Knobs and Press-fit Bushings3-left/3-right solid pegheads.Exceptional smooth, tight feelModern sealed gear tunerVintage 50s stripe detail on housing15:1 gear ratio11/32" diameter pegholes requiredPost height: 1"Press-fit bushings and mounting screws includedSet of 6Chrome Finishwww.kluson.com The Kluson brand was briefly licensed to TonePros*กรุณาตรว.. 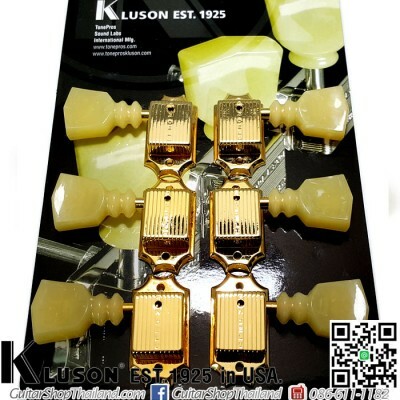 Condition: New ลูกบิดกีตาร์วินเทจ 50s สีทองใบหยก Kluson Genuine Kluson 3L3R Vintage 50s-back Tuners with Keystone Knobs and Press-fit Bushings3-left/3-right solid pegheads.Exceptional smooth, tight feelModern sealed gear tunerVintage 50s stripe detail on housing15:1 gear ratio11/32" diameter pegholes requiredPost height: 1"Press-fit bushings and mounting screws includedSet of 6Gold Finishwww.kluson.com The Kluson brand was briefly licensed to TonePros*กรุณาตรวจสอ.. 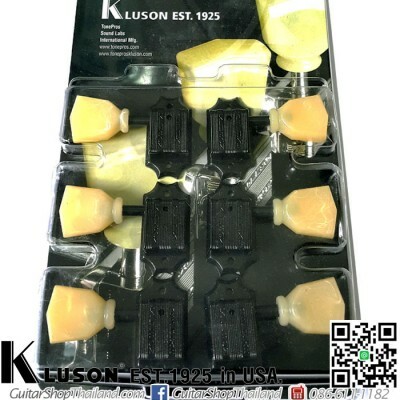 Condition: New ลูกบิดกีตาร์วินเทจสีดำใบหยก Kluson 3+3 Deluxe Tuners with KeystoneGenuine Kluson 3+3 Deluxe Tuners with Keystone Knobs and Threaded BushingsFor 3-left/3-right solid pegheads.Black Finish15:1 gear ratio13/32" (10mm) diameter pegholes requiredThreaded hex bushings, mounting screws, and washers includedSet of 6www.kluson.com The Kluson brand was briefly licensed to TonePro *กรุณาตรวจสอบขนาดและรายละเอียดของสินค้าให้แน่ใจว่าตรงกับสิ่งที่ท่านต้องการ.. 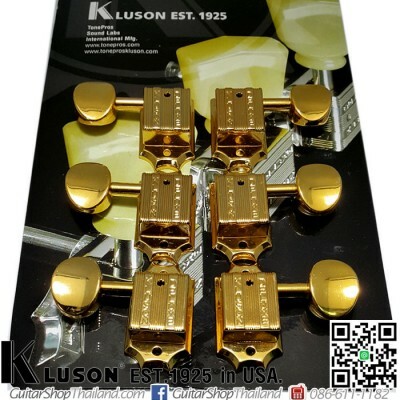 Condition: New ลูกบิดกีตาร์สีทองใบหยก Kluson 3+3 Deluxe Tuners with KeystoneGenuine Kluson 3L3R Deluxe Tuners with Keystone Knobs and Threaded BushingsFor 3-left/3-right solid pegheads.Gold FinishExceptional smooth, tight feelModern sealed gear tuner15:1 gear ratio13/32" (10mm) diameter pegholes requiredThreaded hex bushings, mounting screws, and washers includedSet of 6www.kluson.com The Kluson brand was briefly licensed to TonePros*กรุณาตรวจสอบขนาดและรายละ.. 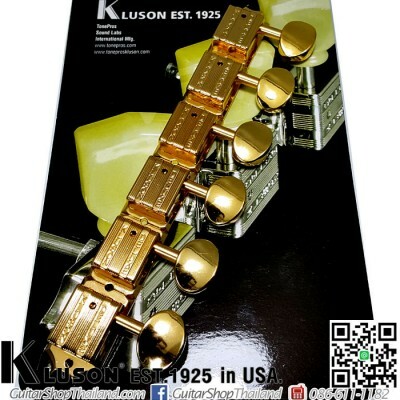 Condition: New ลูกบิดกีตาร์วินเทจสีทอง Kluson Genuine Kluson 3L3R Tuners with Oval Metal Knobs with Press-fit BushingsFor 3-left/3-right solid pegheads.Exceptional smooth, tight feelModern sealed gear tuner15:1 gear ratio11/32" diameter pegholes requiredPost height: 1"Press-fit bushings and mounting screws includedSet of 6Gold Finishwww.kluson.com The Kluson brand was briefly licensed to TonePros*กรุณาตรวจสอบขนาดและรายละเอียดของสินค้าให้แน่ใจว่าตรงกับสิ่งที่ท่านต.. 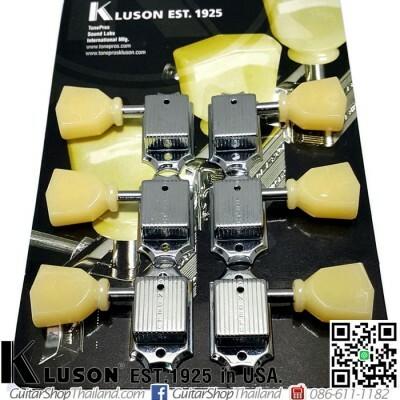 Condition: New ลูกบิดกีตาร์วินเทจสีทอง Kluson Genuine Kluson 3L3R Tuners with with Round White Button Press-fit BushingsFor 3-left/3-right solid pegheads.Exceptional smooth, tight feelModern sealed gear tuner15:1 gear ratio11/32" diameter pegholes requiredPost height: 1"Press-fit bushings and mounting screws includedSet of 6Gold Finishwww.kluson.com The Kluson brand was briefly licensed to TonePros*กรุณาตรวจสอบขนาดและรายละเอียดของสินค้าให้แน่ใจว่า.. 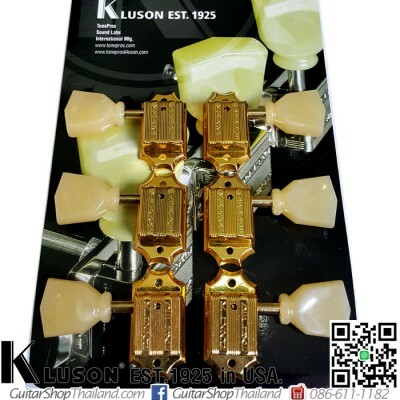 Condition: New ลูกบิดกีตาร์สตัทแถวเดียวสีทอง Kluson Genuine Kluson 6-In-Line Tuners with Threaded Bushings GoldExceptional smooth, tight feelModern sealed gear tuner15:1 gear ratio13/32" diameter pegholes required15/16" string post spacing4-11/16" peghole spreadThreaded hex bushings, mounting screws, and washers includedSet of 6Gold Finishwww.kluson.com The Kluson brand was briefly licensed to TonePros*กรุณาตรวจสอบขนาดและรายละเอียดของสินค้าให้แน่ใจว่าตรงกับสิ่งที..